Here's how it began, "Greetings, O favored one! The Lord is with you; and you will bear a son and call Him Jesus! He will be great! He will save...!" I've presided at Advent, Christmas Eve, and other seasonal services to talk about that/Him for over 35 years; and I still don't quite get it/Him all. I often feel as clueless as that young 12-16 year old virgin who had to be reminded of God's sovereignty - "Nothing is impossible for God!" - before getting it/Him. Writing about this season's reason, Luther wrote, "The virgin birth was a mere trifle for God; that God should become a man is a greater miracle!" Yeah, and like we understand that/Him totally. Anyone who says she/he gets all of that/Him is as full of, uh, whatever as all of those candidates for the big house on Pennsylvania Avenue who are trying to convince us that they know what to do to, uh, save, uh, America and the rest of the world along with us. The message of Christmas - Jesus!!! - is simple; and Peterson captures the simple truth that's so far beyond our comprehension that all we can do is offer thanks in a partially knowing (see 1 Corinthians 13:12-13) burst of wonder, love, and praise: "The sooner we get the message, the better off we'll be, for the message is good, incredibly good: God is here, and He's on our side...God is passionate to save us" (from Eugene's introduction to Mark in The Message). The sooner we stop looking for someone other than Jesus to fix things/us, the sooner we'll get it/Him/Christmas/life/eternity. That's when we'll really get Phillips Brooks carol: "How silently, how silently, the wondrous gift is given!...Where meek souls will receive Him, still the dear Christ enters in." Maybe that's why God's angel first broke the news to that young virgin. Maybe that's why Jesus always seemed happiest around children. Unlike grown-ups who banter and moan about everything that's gotta be done to make the season bright - and ever notice how they really never get there except for a few moments, uh, after the big eve/day; and then they're so busily, busily, busily off to stress out over the next... - children just get into it/Him and could care less about, uh, well, uh, you know; and if you don't, that means you're still caught up in the holly more than holy. Stop being so defensive about ruining the season for yourself by getting caught down in the preparations more than meaning/experience. Don't you really, really, really want to...? A man's man in Virginia who's still got the heart of kid sent this video to me. Peterson wrote in Praying with the Early Christians: "Meditation is a nearly lost art - and not easy to acquire in a noisy world." Then he prayed, "God, let me withdraw for a while now from the chatter and gossip of the world, and let your words sink deeply into my mind and spirit. In the quietness of these moments, help me to realize the eternal significance of the birth of Jesus, in whose name I pray. Amen." Kathie and I and the whole staff of KD (actually, uh, we're the whole staff) along with our families and the family of faith at First Presbyterian Church in Belvidere, Illinois are praying your Christmas and 2012 will be filled with the love, joy, and peace of knowing Jesus in all seasons. One of my friends showed up for coffee on Tuesday morning with a copy of the book. Dang, I don't even have a copy yet. Of course, I know what's in it; and before anyone asks, I thought I'd better explain why I wrote it. I learned a valuable lesson from VMTC which learned it from 1 John 1:5-10. It's better to dump your garbage before someone else digs it up. Somebody should have mentioned that to Cain, Fine, and Sandusky. Maybe you've seen the promo: "It's raw, rough, real, and maybe even redemptive; and he could lose his day job for writing about it! 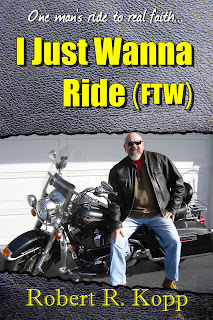 I Just Wanna Ride is an Ivy League pastor's search for authentic faith on a motorcycle after he couldn't find it after years in academics, pulpits, or pews. From his immersion into biker culture since watching Easy Rider as a teen-ager, the author holds no punches in this provocative, edgy, and risky look at hogs and those who ride 'em as a metaphor and challenge to believers and bikers. Too authentic for "church ladies" and too concerned about "faith" for secularists, this book demands reading by all of 'em if any of 'em still care about Who and what matter most sooner or later and definitely in the end." I want to honor Him through the book. I love my chrome pony and biker culture. I want to encourage the authenticity of bikers which is a metaphor and challenge to pewsitters and pulpiteers. I want to encourage freedom to be who God designed people to be - as unique as snowflakes yet as complementary and interdependent as snow. That was an awful metaphor. Please trust the book is better. Really, did you expect me to tell you why I wrote the book in Cliff Notes style? I want you to buy and read the book! This KD is more about interrogatives surrounding the book; as opposed to the substance of the book. Besides, while I think I know what I was/am trying to communicate, I predict folks will have their own impressions about its message as well as the messenger. Matthew 23 and 1 Corinthians 1 are big background hints. It's been out in its electronic version for about two weeks via www.amazon.com. The book version, my friend who showed up for coffee with a copy on Tuesday told/showed me, is now out via www.amazon.com. You can also get copies from my publisher via http://blackoaktitles.wordpress.com/new-releases/i-just-wanna-ride-ftw/. Or if you'd like me to make some money on it, you can order copies from this site or order from me at drkopp@inwave.com or drkopp@belvpresbyterian.org. The electronic version via www.amazon.com is $5.99 while the superior paperback version with really neat pictures on and in it in addition to snugglin' possibilities is $13.95. Annnnnnnd you can buy really neat looking "I Just Wanna Ride" hats for $15 at this site or, again, from me at...(see above). Black. Red lettering. Better and more authentic than the hats being sold for/by Sons of Anarchy which I still watch despite it becoming a caricature of its former, uh, self. Add shipping and handling and, uh, donations if you order directly from me. Speaking of $, here's how I'm gonna handle royalties. He should make the most because he took the big risk. As pour moi as in what's left over, 25% (firstfruits) goes to Jesus. I have established a line item in First's budget to receive these offerings for benevolences and mission-minded kinda stuff. 55% goes for assistance to family and friends. 20% goes to research and development (e.g., research on the next book 'cause the foundations for clergy renewal are more into gardening and needlepoint than mounting a mule and taking a month to travel around the country to ask people of all persuasions What It Means to be Faithful in a Country that Doesn't Give a Damn About God Anymore, MC upgrade, riding $, and the like). Some folks, no doubt, especially posers who pretend on Sundays what they don't practice anytime or anywhere with anyone, will have, uh, issues with the quotables in the book. Of course, my mom is concerned: "What will some people think?" Response: "The book is in the language of 'real' not posing pewsitters and pulpiteers who talk like angels in the sanctuary and often like sailors in the streets. Yes, it will offend some; but as Paul noted, we must learn the language of people to communicate. I'm willing to take some personal risks to get people to discover the kinda faith that makes a difference 'cause the conventional kind ain't doin' much for many anymore." That's what the book is about. I probably won't be writing much more about what I wrote about in the book. But if you'd like information on how you can host an event, just write to Kathie or me and we'll offer some suggestions. The most important thing to me is the message of the book that inspired the message of this book. Nope, you gotta buy the book! Buy lots to give away in a Christian kinda way. You decide if it's shameless. I don't remember much useful from seminary. It's kinda like the old pastor with a growing church and no formal education told me just after I arrived in town (Parkesburg, Pennsylvania) so freshly ordained with my academic hoodie to serve a church that had been dying for a decade, "You can't give away what you ain't got for yourself." That's a big clue as to why so many churches are closing shop. It's worth repeating...and then looking in the mirror: "You can't give away what you ain't got for yourself." Anyway, I'm reminded of one of the few things that has stayed with me from those heady days in seminary. A guest preacher in Miller Chapel caught my attention with this opening sentence, "A trustee went to see the pastor because the church couldn't afford to pay its bills." I thought, "Yo! This is Princeton, man! We don't talk about stuff like that! We're into Barth, Rahner, Moltmann, and, uh, Chavez! This is so...proletarian!" Be that as it was and may remain, he continued, "The pastor said to the trustee, 'I'm a scholar/theologian/pastor and, ergo, I am only concerned with the spiritual problems of the church. I don't concern myself with financial problems. You need to talk to the rest of the trustees and elders about this." "The trustee returned to the pastor after meeting with the other trustees and elders," he went on, "and said, 'Pastor, we have a serious financial problem in our church. It's so bad that we may not be able to pay your salary!'" The pastor asked, "Why didn't you tell me it was that serious? But as you know, I'm a scholar/theologian/pastor and, ergo, I am only concerned with the spiritual problems of the church. You need to bring up this financial problem at our next board meeting." At the start of the next board meeting, the trustee stood up and addressed the pastor, "We've got a spiritual problem in our church." There are no financial problems in churches; especially American ones. Financial problems expose spiritual problems. Another quip from that old pastor with a growing church and no formal education: "People don't give a rat's ___ what Cyril of Alexandria said. They want you to tell 'em what Jesus has to say about being one of His children." The preceding came to mind as I consider our current renovation and expansion on the corner of Lincoln and Main in Belvidere, Illinois. Aside from the tough economic climate, I've never served a church with so many financial problems. Despite the fidelities of many who get it/Him, our bills exceed our expenses so much that we've had to almost exhaust our endowment to finish off the renovation and expansion. Or as I mixed metaphors for a receptive elder on Sunday night, "We've been trying to satisfy champagne diets on a beer budget." That doesn't work well with teetotalers. I'm talking in reference to Acts 2:14ff. A friend who is pastor of a poor church near Kansas City called last Saturday. Overlooking/forgetting/ignoring/disrespecting the context of his ministry, I whined about exhausting our endowment to pay the remaining bills of our renovation and expansion. We go way back; so I anticipated some comforting and caring counsel. Instead, he said, "What's wrong with you? Where in God's name did Jesus ever say we're suppose to store up treasures on earth like latter day Scrooges? Doesn't your Bible include Matthew 25? And what about His confrontation with the rich young ruler? You should be happy God is removing the sin of storing up a pile of money so you can get your church more prepared to meet the increasing needs of people in your neighborhood. It's not about money anyway. It's about being missionaries in your community. Didn't I read that in your bulletin the last time I was with you? Beacon! Safe haven! What's wrong with you? Praise God you're being faithful and using money for Him rather than stockpiling it like rich old..."
As a matter of recollection, the churches that I've served that didn't have financial problems didn't have endowments. Our Lord never said money was the root of all evil. He said the lust/idolizing/greediness/stinginess that we often have for/about $ is at the root of all evil. I liked it because I trusted it. I trusted our endowment for our security. Trust is suppose to be in God alone! Trust is suppose to be in God alone through people who know trust is to be in God alone! I may be wrong; but the corner of Lincoln and Main is in for one of His greatest, uh, disclosures/exposures in a Matthew 25 who's your real daddy/Daddy kinda way. Advent 2011 is more about preparing for His final advent as glorious King of kings than celebrating His first advent as Babe of Bethlehem. Part of the preparation is stewardship of what He's entrusted to us. Did He bless us in order to put it in a bank for use at some later date? Did He bless us so we could gloat in the growth of our portfolio? Did He bless us to live off the interest? Did He bless us for trickles or rivers? Did He bless us in order to spend it, depending upon our frail human judgments, in ways that will honor Him by being a beacon for Him and safe haven for His? Did He bless us in order to act like the antithesis of the rich young ruler? Did He bless us so we could say so gleefully with the young tart hawking electronic books on TV, "It's more blessed to receive than give!"? Did He bless us to be safe in the harbor or...? Did He bless us to pick up fruit from the ground or go out on the limb for...? I don't pretend to have all of the answers. Yet I remember another story about the stewardship of investments. Paraphrased punchline by Peterson: "Take the thousand and give it to the one who risked the most. And get rid of this 'play-it-safe' who won't go out on a limb. Throw him out into utter darkness.'" Storing it all up for someone/something for some use, uh, later on? Giving it all up for Jesus now for then? I'm not sure; but I'm gonna try to figure/pray it out before His next advent. I don't want to be on the wrong side of the, uh, ledger. Quickly, the end of December is approaching; and you know what that means. I can't believe it's time to write another annual report. Of course, considering annual reports come annually, I guess it makes sense. I'd rather look forward to the future than look at my, uh, behind. Few things are less appealing to me than writing or reading ecclesiastical rationalizations, uh, I mean, uh, annual reports. That's because I envision churches as passionate, forward-looking, mountain-moving, evil-busting, mission-fueling stations more than museums or mausoleums. Last year's disappointments can't be changed. Last year's successes are like last year's winners of the Super Bowl - irrelevant to now and then. Christianity is so much less about what was and so much more about what will/can/must be. I believe Christianity, at His best, is more about making living memories by building upon the best of the past for a better today and tomorrow than wasting so much time on what's over and done and longing for the way things never were or maybe were but are no more. I believe Christianity, as His best, is more about trusting His "better" than before by making room for His fresh ways of knowing Him and making Him known (see Matthew 9:16-17). Simply, God is always up to something better than before in our lives and we must make room for His improvements. Of course, these are tough times for everybody; and there are no sociopoliticoeconomic indicators suggesting things are going to get any easier any time soon. Surely, we know tough times expose more than build character. And the greater reality is overcoming the worldly reality because of the Wordy truth: "The One who is in you is greater than the one who is in the world" (1 John 4:1ff.). Oswald Chambers wrote, "Our Lord said, in effect,...'You are to have no end, no aim, and no purpose but Mine'...When we are born again, we all have visions, if we are spiritual at all, of what Jesus wants us to be, and the great thing is to learn not to be disobedient to the vision, not to say that it cannot be attained." Philippians 4:1ff. comes to mind. That's why we look forward instead of at our, uh, behind(s). Advent recalls His first coming as the Babe of Bethlehem, continuing coming into our lives as Holy Spirit, and ultimate/final coming to usher in the Kingdom in all His glory. That being said/true/understood, annual reports, at His best, are at, uh, His best when concentrating on who we can become so much more than how we've been. I think that's what it really means to prepare the way of the Lord. We are getting ready for His advent(s). It's about praying and wanting and working to face the future more faithfully. It's so much better to flush what's in our behind(s) in favor of moving into a future molded after His likeness. That may be my favorite song of all time; expressing my deepest desire, greatest prayer, and most fervent ambition. I want to live a wholly holy life for Him in praise and thanks for the gift that's especially celebrated/noticed around this time of the year. That's why we celebrate the reason for this season. He bridges the distance between desire/prayer/ambition and reality. Desire/prayer/ambition: David Crowder's Wholly Yours. Reality: Willie Nelson's There's Nothing I Can Do About It Now. Or as I explained to a brother about someone who doesn't get it/Him in the spirit of Titus 1:16: "The difference between authentic believers and posers like her/him is authentic believers know they're hypocrites who can't save themselves." Near the Sheep Gate entrance to Jerusalem which is not too far from the Golden Gate entrance to the Temple where I visited many times when I was a really important high steeple preacher, Jesus saw an invalid of 38 years hanging out with the blind, lame, paralyzed, and otherwise disabled people who gathered at the Bethesda pool just inside the old city because, well, uh, it was where they, uh, hung out together while hoping for something/Someone to come along to, uh, heal 'em. Seeing the man had been hanging around at the pool for a long time in such a seemingly hopeless state, Jesus asked eyeball-to-eyeball with disarming directness, "Do you want to get well?" That is the question; and the question itself indicates emotional, intellectual, spiritual, and physical health have more to do with volition than hyper-determinists/fatalists, uh, think. Jesus is more than suggesting a direct connection between desire/prayer/ambition and reality. Maybe that's why He also said, "Ask, and you will receive. Seek, and you will find. Knock, and the door will be opened for you." Maybe that's why Franklin's daddy always talked about decision. It's a decision to get well. A decision to get well is the first step to healing. What we decide goes a long way in determining our destinies. Puuuuuuuhleaaaaaaase don't get caught up in those sophomoric debates on free will versus predestination. Even Calvin talked about volition in determining outcome (read his commentaries more than his commentators). Yeah, I believe we're predestined. Yeah, I believe I have the free will to choose. So thank God for His ultimately gracious control (predestination) while never forgetting personal responsibility (choice). Enough on that last rabbit trail. Let's just get back to Jesus; which is always the best thing to do now before then. He asked, "Do you want to get well?" Two blind men shouted out to Jesus as He was leaving Jericho, "Lord, Son of David, have mercy on us!" Jesus stopped and asked, "What do you want me to do for you?" They said, "We want to be well. We want to see." Oswald Chambers: "A simple statement of Jesus is always a puzzle to us if we are not simple." Have we made trusting Jesus too complicated? Again, OC: "Every time we have gone back in spiritual communion, it has been because we have impertinently known better than Jesus Christ." Are we too smart for God? OC: "If we are not experiencing the 'much more,' it is because we are not obeying the life God has given us, we are taken up with confusing considerations." Is it/He really that simple? Jesus: "Seek first...[Him]...and all these things will be given to you as well." It can't be that easy! Jesus: "If you had faith as small as a mustard seed, you could..."
Regularly, people ask me to heal them. Sooner than later, I always say, "Silver and gold I do not have; but what I have, I give you. Jesus!" Only Jesus has divine answers to our human challenges. Only Jesus has the divine ability and affection to help/heal. Nobody but Jesus has more than Band-aids for what ails us. She was there at His first advent as the Babe of Bethlehem. Luke: "She was very old...She never left the Temple but worshiped night and day, fasting and praying. Coming up to Joseph and Mary, she gave thanks to God and spoke about the child to all who were looking forward to the redemption of Jerusalem." Peterson: "The Temple in Jesus' day, like the church in ours, was full of those who had their minds on business and gossip. But Anna was there to worship. 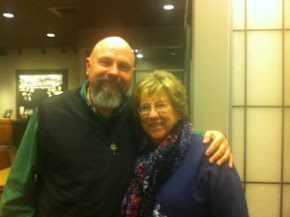 Her single-mindedness was rewarded when she recognized Jesus as God's redemption." Psalmist: "God inhabits the praises of His people." Simply, God works spectacular/supernatural/saving graces in the lives of those who worship Him really/authentically. Are you a poser or an authentic? Good trees (authentics) bear good fruit. Getting closer and closer and closer to Jesus yields...fruit. Conversely, moving away from Jesus yields...nothing. Samuel: "Those who honor Him are honored by Him." Hebrews: "God is a rewarder of those who diligently/earnestly seek Him." Really, it's not that hard to figure out. Posers never get it/Him; and act like it less than more. Authentics get it/Him; and act like it more than less. Just answer the question honestly. Emmanuel comes when Emmanuel is asked: "O Come, O Come..."